China's Nan Song performs to music from the "Requiem for a Dream" soundtrack by Clint Mansell at 2011 Trophée Eric Bompard. The Grand Prix series this fall was a breakthrough for China’s Nan Song. He won his first Grand Prix medals, a bronze at the Cup of China and a silver at the Trophée Eric Bompard, and is the first alternate for the ISU Grand Prix of Figure Skating Final. That’s a huge leap for the 21-year-old, who was ranked a distant 22nd at the 2011 ISU World Figure Skating Championships, and it was a big surprise for everyone. Indeed, he started to land the quad toe in competition this season. His free skate to Hungarian Rhapsody in Shanghai at the Cup of China was brilliant and almost perfect with two quads and two triple Axels. 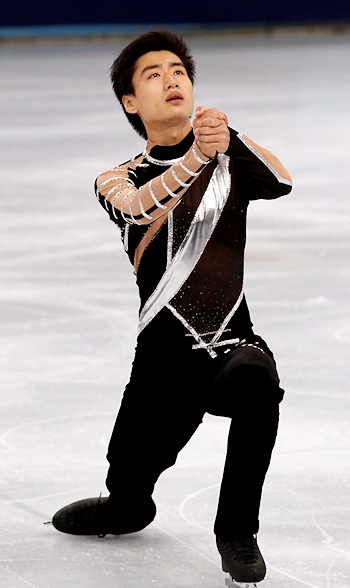 Song was successful in the junior ranks, taking the silver at Junior Worlds and in the Junior Grand Prix Final in the 2009-10 season, both times behind Japan’s Yuzuru Hanyu. He had less stellar results in his first senior year, but now he has stepped it up and emerged as a new contender. Currently, Song’s success is mostly based on his strong jumps, and he knows it. In the past, top Chinese skaters went to work with well known foreign choreographers such as Lori Nichol, David Wilson, or Nikolai Morozov. Song’s programs this year were choreographed by Chinese choreographer Feng Huang. Song easily admits that the jumps fascinate him in skating. “I like the challenge,” he pointed out. When he was younger, he looked up to Russia’s Evgeni Plushenko and Alexei Yagudin mostly because of their jumping ability. However, he also watched China’s Lu Chen and Chengjiang Li. With the success of the Chinese pairs, pair skating is still the most popular discipline, but singles are catching up. “The audience likes to see spectacular elements, and single skating is getting more popular with skaters doing quads,” Song commented. Song admits to keeping last year’s short program to Requiem for a Dream because he likes the music a lot. The long program, however, is new and Song enjoys skating to this classical piece as well. In his spare time he also enjoys badminton, basketball and computer games. Song is an attractive young man (very popular with female Chinese fans) with a quick smile and a good sense of humor. He appears a little shy, but is puzzled by the question. A fun episode from the Trophée Eric Bompard still makes song laugh. After the Men’s event and the press conference were finished he went back to the hotel nearby. The ceremony was scheduled to take place after the pairs about one and a half hours later. However, when everyone was getting ready for it, Song was missing. “Our judge came to the hotel looking for me and we ran back to the ice rink,” he recalled. He made it in time to receive his silver medal. Song is now living and training in Beijing in the Capital Gymnasium Sports Complex. Beside the stadium (which was used for the Cup of China in the past) houses a practice rink and dormitories for the skaters. He moved here from his hometown of Qiqihar in northern China. Song’s parents put him into skating to improve his health. His older brother Bin was a swimmer, but is now studying full-time. Song himself is studying at the sports institute like most athletes in China. “I think studying is good to distract myself from skating,” he noted. With the up and coming juniors led by Han Yan in mind, Song is aiming to confirm his good Grand Prix results later in the season at Four Continents and Worlds. Being first alternate for the Grand Prix Final was an important step for him.